Rothko withdrew from Yale his second year and moved to New York City to study art with Max Weber at the Art Students League. Weber encouraged his students to study Cezanne's depictions of light and human form. Weber's influence is evident in Rothko's painting of female bathers, likely painted on a trip with Avery. 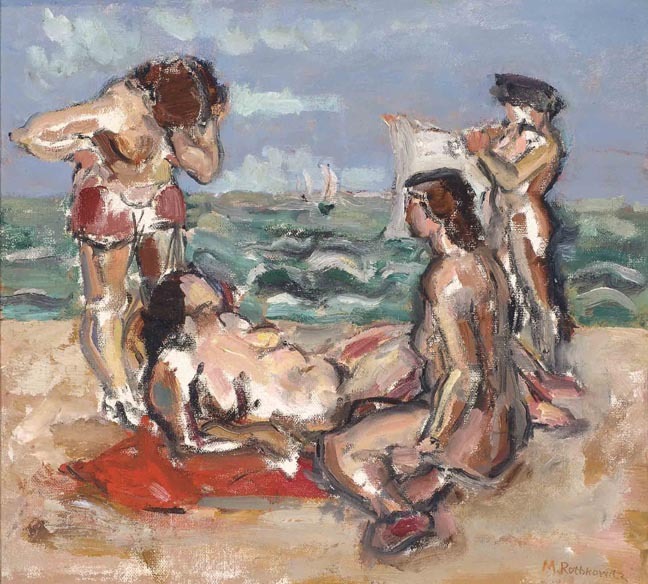 Louis Kaufman introduced Rothko to Milton Avery at the Opportunity Gallery in New York in 1928 (the same year this beach scene was painted), where Avery was exhibiting work. Rothko and Kaufman grew up together in Portland and remained life-long friends. Louis Kaufman became a celebrated American violinist and worked extensively in the movie industry. Kaufman and his wife Annette were thoughtful, inspired collectors, buying paintings directly from artists, most of whom were quite poor and had no gallery representation. The Avery's were their closest friends, and Rothko quickly became a part of their artistic and social community. Avery introduced Rothko to Adolph Gottlieb, who had a profound influence on Rothko's art and politics. In 1934, Gottlieb, Rothko, and painter Louis Harris (also in the Reed College Art Collection) were founding members of the artists' group "The Ten." The Ten called for an expressive, political American art in opposition to "sentimental" and "nostalgic" imagery. In a 1938 manifesto written in protest over the '38 Whitney Biennial, The Ten declared their mission to "... see objects and events as though for the first time, free from the accretion of habit and divorced from the conventions of a thousand years of painting." Both Rothko and Gottlieb revered Avery as a humble and dedicated progenitor of this vision. The son of a tanner, Milton Avery worked full-time in factories and later as a file clerk to pay for his painting education in Hartford, Connecticut. Louis Kaufman introduced Mark Rothko to Avery in 1928, and the two quickly became close friends. Eighteen years Avery's junior, Rothko was deeply inspired by Avery's simple, colorful and emotive forms. Through Rothko, Avery soon met many other young artists such as Adolph Gottlieb, Barnett Newman, and Helen Frankenthaler, all of whom frequently visited Avery's studio to watch him paint. For a time, Rothko and Gottlieb visited daily, and for several years Avery, Rothko, Gottlieb and their families all summered together in Provincetown. Avery liked to paint while his friends spent time in the studio. Kaufman would often play violin while Avery worked. The Kaufmans purchased the four Milton Avery paintings in the Reed College Art Collection directly from Avery. Avery's practice was intrinsic to his everyday life. He saw painting as the primary vehicle for expressing his feelings, passions, and personal experiences, often lovingly depicting the people and places with which he felt a strong personal affinity. His dedication to developing his craft, combined with his rapid rate of output, resulted in a vast and stylistically diverse body of work. His ethos is perhaps best encapsulated by his oft-quoted phrase, "Why talk when you can paint?" able to survive in our time."